Watching Frank Kaminsky play was an unforgettable experience, and we might never see anything like it at Wisconsin for decades. After Kaminsky’s jersey was retired on Thursday, it brought back memories of the “Make ‘Em Believe” era of Wisconsin Basketball, and it reminded Badgers fans just how special Kaminsky’s run was. Growing up, I was never much of a college basketball fan. I always preferred the NBA and watching Bucks games around my home in the Milwaukee area, even though the Bucks have been terrible for as long as I can remember. I was raised into the NBA, and my preferences were largely shaped by my experiences and memories of going to watch Michael Redd, Brandon Jennings, or whoever the Bucks would put out on the floor in pursuit of some middle ground playoff spot. I never went to a Badgers basketball game until college. 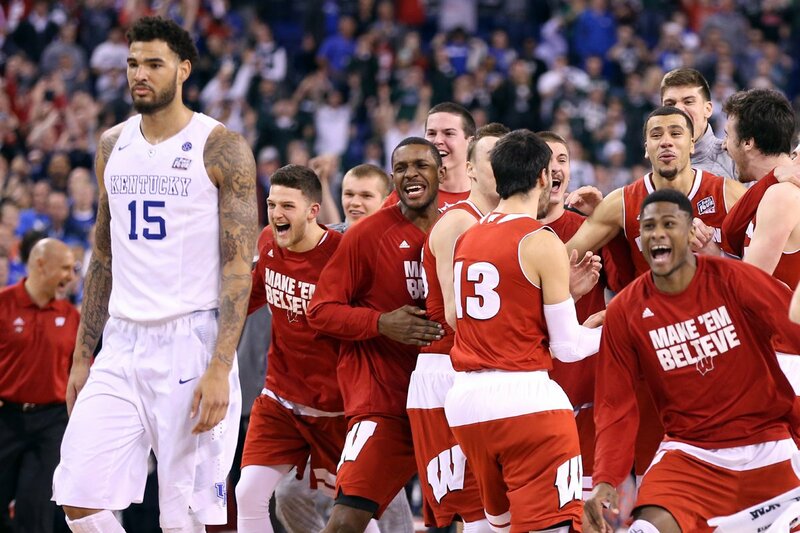 To me, the Badgers were just a team to root for during March, never really expecting them to get anywhere. All of that quickly changed. When the Badgers started to win with their dynamic duo of Sam Dekker and Frank Kaminsky, I naturally payed more attention to them. In 2014, which was my senior year of high school, the Badgers took down Arizona in an overtime thriller. Frank Kaminsky broke into the spotlight with his 28 point performance, and the national sports media was picking up on it. Frank Kaminsky can play in the NBA. People called Skip Bayless crazy for that tweet, and understandably so. Kaminsky was a guy nobody outside of Wisconsin had heard of until his 43 points against North Dakota that year. Kaminsky still had to prove himself a little more, but few people could have expected how wild of a ride the following season would be. I came to the University of Wisconsin-Madison as a freshman hoping to get season basketball tickets and the chance to see the Badgers play at the peak of their hype. The Badgers were predicted to fire on all cylinders and make a serious run in the NCAA tourney after their crushing disappointment the last season. I remember being at my dishwashing job and listening on the kitchen radio as Kentucky’s Aaron Harrison hit a clutch three-pointer to end Wisconsin’s hopes of reaching the national championship game. When the next season arrived, I was as excited as anyone else to see Wisconsin come back for another run at the gold. I was lucky enough to snag season tickets that year, and I started going to all the games. Fans knew when they went to a Badgers game that Kaminsky would come to play, and the Badgers would dominate. Some nights it seemed like “Frank the Tank” was unstoppable, scoring at will in the paint and stretching the floor with a few threes. The squad ran deep, too. When Kaminsky was off, he still shared the floor platoon of willing and capable scorers. Kaminsky, as well as Sam Dekker, Josh Gasser, Traevon Jackson and Nigel Hayes would usually start the game and establish a sizable cushion. Bronson Koenig, Vitto Brown, Zak Showalter, and Duje Dukan would then come in and torch the opponents’ bench. Some of the latter players would come to define the program in the future, and still managed to reach the Sweet 16 in the following two seasons. In the preseason, the media unanimously picked the Badgers to win the Big Ten, and many of them expected them to be a Final Four contender. Meanwhile, Kaminsky himself was the preseason Big Ten Player of the Year and starting to gain consideration for National Player of the Year as well. As the season went on, it was clear that the Badgers were up for the challenge. The Badgers had a strong, blue-collar identity, especially in that season. Head Coach Bo Ryan had a group that would bring energy and effort every night, moving the ball on offense and playing hard on defense. If they couldn’t beat you with raw talent, they would find another way to do it. The Badgers rolled through the NCAA tournament that year, taking down Coastal Carolina, Oregon, and North Carolina to reach the Elite Eight. They knocked off Arizona for the second straight year to return to the Final Four. Then, against all odds, they took down the undefeated Kentucky Wildcats in the semifinal game. It was the ultimate revenge against the team that had eliminated them the previous year. To say that it was the biggest win in the history of the program is not an overstatement. Everyone was ecstatic, even if just for a few nights. It was unreal to be a part of this experience as a student, and witness everyone come together to support the basketball team. As years went by and I continued to watch the Badgers in the NCAA tournament, I realized how awesome it was that we made the Final Four twice. Of course, losing to Duke wasn’t the perfect ending, but at the end of the day only one team can be champion. As fans we should reminisce on all the victories we enjoyed on the road to the championship rather than hang our heads over one hard-fought loss. It might be cliché, but the journey really is greater than the reward. I’m not exaggerating when I say that Frank Kaminsky and the 2015 Badgers turned me into a devoted college basketball fan for life. I’m sure many other students and fans have similar stories. Kaminsky’s legacy will forever be immortalized by the number 44 hanging over our heads, and the memories of Wisconsin’s success with him will always have a place in the hearts of Badgers fans.